Some 400 years since his death in 1616 on his 52nd birthday, festivals, exhibitions and performances all around the world in 2016 will celebrate the legacy of William Shakespeare, arguably the finest playwright and poet ever to write in the English language. Here in the UK, all eyes will be on the Warwickshire town of Stratford-upon-Avon as an exciting programme of activities and events to commemorate its most famous son reaches its climax. And where else could be better to celebrate Shakespeare’s legacy than the place he was born, went to school, married and raised a family, was inspired to write many of his most famous work and, after his death on 23rd April 1616, was buried in the local church? 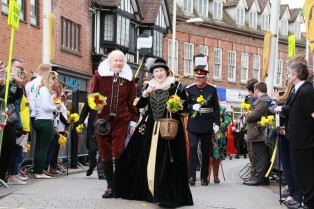 For Shakespeare’s Celebrations, a local initiative jointly led by Stratford-upon-Avon Town Council and Stratford on Avon District Council, 23rd April 2016 will bring a wonderful opportunity to focus on the Bard’s birthday and to celebrate his 400 year legacy with a unique ‘take’ on the traditional Annual Parade through the town, combining birthday and commemoration in a very special way. “This year Shakespeare’s Birthday Parade will be a spectacle like nothing we have seen before in the history of these precious, traditional celebrations which we want to preserve for future generations. “We will, of course, see all the usual participants, among them civic dignitaries, VIPs and invited guests from the worlds of literature and theatre, students of Shakespeare’s school and characters in period dress, all accompanied by marching bands and many local schoolchildren making their way through the streets towards Holy Trinity Church. “But beyond the customary ceremonies the truly international influence of William Shakespeare will be apparent in the exciting high point of our Parade – I can tell you that it will be full of music, colour and action, but we’d love you to come and see for yourselves exactly what that brings! The Birthday Celebrations extend to a whole week of events, culminating in a weekend of festivities and entertainment for all the family at venues throughout the town, many of them outdoors and most of them free of charge. Elsewhere in Shakespeare’s beautiful home town, fascinating new attractions opening for visitors in this very significant year include a re-imagination by the Shakespeare Birthplace Trust of the Bard’s final home, New Place, and the opening to the public of the room at King Edward’s School where he might first have put pen to paper as a boy scholar. Both the Schoolroom and the historic Guildhall have been extensively renovated to bring a heritage project of international importance to fruition. The Royal Shakespeare Company will house a major new exhibition at its Swan Theatre, celebrating the magic of Shakespeare on stage and 100 years of theatre-making in Stratford upon Avon and a discovery tour at The Other Place, RSC’s newly reopened research and development hub, will take visitors on a journey ‘From Page to Stage’ with a chance to look inside the RSC’s store of 30,000 costumes for the first time. Sarah Summers continues: “William Shakespeare’s life and literary works are his legacy to everyone, but most especially to our Warwickshire town of Stratford-upon-Avon, where he spent so much of his life and where he is buried. This 400-year legacy of its most famous son lies at the heart of cultural, economic and social life in the town and surrounding area today. 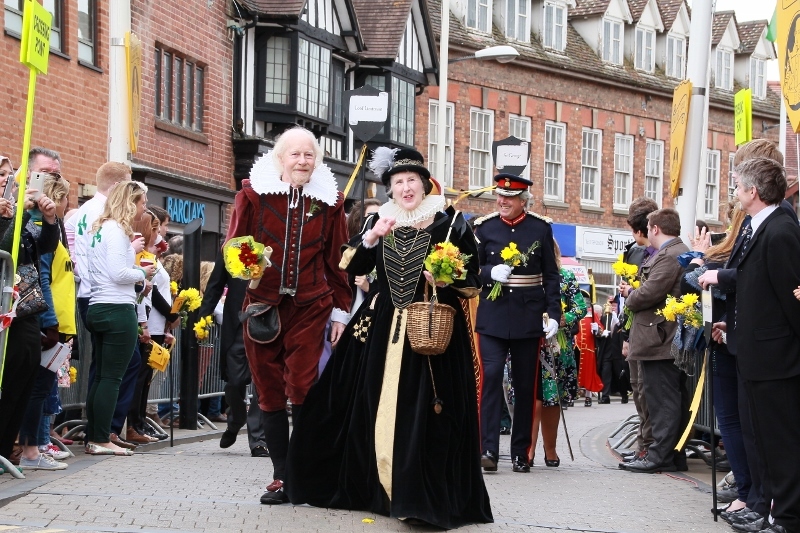 Shakespeare’s Celebrations is an initiative jointly led by Stratford-upon-Avon Town Council and Stratford on Avon District Council, working to safeguard the future of the traditional Shakespeare Birthday Celebrations. Key organisations in Stratford-upon-Avon including the Shakespeare Birthplace Trust, the Royal Shakespeare Company and Stratforward Business Improvement Company are working with them to develop a major timetable of events for 2016 to celebrate the legacy of the Bard 400 years after his death in 1616.